Ideally every starship type created for Star Trek should be a distinctive design with well-defined specs that are consistent throughout all of its appearances. While excuses for varying crew sizes, armaments or top speeds are relatively easy to find, it is obvious that the ship's size has to stay the same in comparison to other ship types. This is not always possible in the real production process, the reasons being technical limitations, budget shortages, tight schedules or lacking communication between producers, designers, modelers and visual effects (VFX) team. Sometimes starships and other structures such as space stations are even deliberately scaled up or down. While the article about ship sizes focuses on the reliability of size figures and observations, this discussion is about the usefulness of starship scaling, taking into account real world physics and engineering. The question is whether, in case of different VFX dimensions, we can assume there are actually different ship sizes or if this might be rather attributed to a strange "lens aberration" making the ships appear bigger or smaller than they are. The most obvious example for excessive scaling of a starship, the Klingon Bird-of-Prey, is discussed on a separate page. 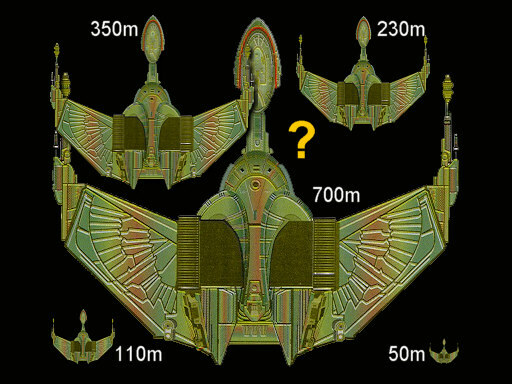 Another page analyzes the sizes of the Kazon raider and fighter. Several more ships were subject to scaling, however, they were mostly "Alien-of-the-Week" ships reused for other ships of little prominence. See the Starship Articles index for links to numerous ship re-uses many of which apparently changed their sizes. Small BoP on Vulcan in "Star Trek IV"
Giant(?) BoPs in TNG: "The Defector"
Scaling ships up and down for the TV screen is easy, but what does it mean pertaining to the "real" starship? What might be plausible reasons for a real starship developer to take a ship design and alter its size? A popular fan theory is that the bigger or smaller version of a proven design will have essentially the same properties relative to its size. There is, however, a fundamental error in this assumption, no matter if fictional or real physics is applied. For many years space scenes with starships and stations have been created with motion control photography of miniatures. With motion control photography, the miniatures to appear together on screen are usually filmed separately, and even each single ship requires multiple passes that are merged in post-production. As soon as different takes from different ships have to be combined, there is a wide margin of error as the filmed material is scaled. And even if it were useful to film two ships in one take, for instance if they are supposed to fly close together and in the same direction, it is often impossible as there are no standard scales of ship miniatures but only standard sizes (such as 2ft, 4ft, 6ft, or smaller sizes for less significant "guest ships"). 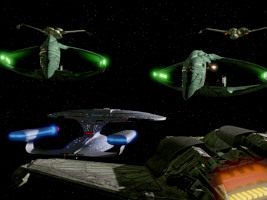 More recently in Star Trek Voyager and Enterprise, visual effects are customarily CGI (computer generated images), which require none of the extensive hardware any longer. Nevertheless, the principal problem of unintentional scaling remains. 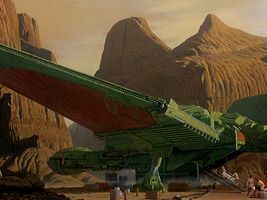 In some cases ships are even intentionally scaled up or down in VFX shots so as to represent a bigger or smaller ship than what the CGI model was initially meant to be. It is trivial that the cross-section increases/shrinks with the second power and the volume with the third power. Yet, this leads to what could be called the "scaling paradox". 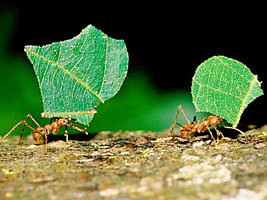 Small insects are often said to have astonishing abilities, for ants are able to carry loads that are a multiple of their own weight, and fleas can do leaps of a few meters, not much less than a human being. A miracle of nature? Not at all. It is actually not a paradox, not even a physical phenomenon, but a sheer mathematical effect, the so-called square-cube-law. A human being scaled down to the size of an ant or flea, respectively, would be even more powerful. Bird-of-Prey: one, two or even more sizes? Let us assume a human being is reduced to 1/1000, which would be roughly an insect's size. The cross-section (like every area) would shrink to 1/1,000,000 (10^-6) and the volume even to 1/1,000,000,000 (10^-9) according to the above table. Since the force someone can exert is roughly proportional to the muscle and bone cross-sections, it would shrink by the above factor of 1/1,000,000. The weight, on the other hand, is proportional to the volume and therefore subject to decrease to 1/1,000,000,000. It is easy to notice that there is a force surplus over body weight of 1,000 for our miniature human. The effect is that while the full-size human can lift roughly half of their body weight, the scaled down version would have the necessary force for 500 times their weight. This is relatively much more than an ant is able to carry! On the other hand, if an insect were scaled up to a size of several meters, it would not be able to stand on its own feet, let alone move around and threaten us. At their original size, ants can afford to have such thin legs compared to their body, while it doesn't work for a bigger animal. No need to be scared by old B-movies like "Them!" or "Tarantula" from the 1950's! It is obvious that the same considerations as for living beings must apply to starships. To provide the same stability a bigger starship with the same shape needs comparably stronger walls than the smaller version. The structural integrity field (SIF) could be reinforced to compensate for this effect, so this is not exactly an argument against using the same hull shape for both big and small ships in the Star Trek Universe. Yet, it shows that the redesign in case of scaling is equivalent to designing, simulating, building and testing a completely new ship, since the physical properties of the hull are anything but comparable. So why would a starship designer try to retain the shape of the smaller ship by all means, while a different, most likely more compact shape could be more suited for the big version? In the particular case of the Bird-of-Prey the VFX people did at least take into account that the bigger K'Vort class wouldn't likely have moveable wings for the obvious reason that an enormous force would be necessary to lift them. So how can the wings still look the same at all? Similar considerations as for the hull would be necessary for the warp and impulse drives, weapons, sensors and other external components. There is no reason why the bigger disruptors on the K'Vort-class Bird-of-Prey should look like the smaller ones on the small scout ship. On the contrary, even if the Klingons took the smaller version as the basis of the design, the required optimization of this essential part of their ship would almost necessarily result in a noticeably different appearance. Furthermore, a complex device like the disruptor consists of numerous components the redesign or rearrangement of which is even more likely to change its appearance. The internal arrangement needs to be completely changed anyway if a bigger or smaller ship is desired. Usually this would happen in parallel to the design of the outer hull, for it doesn't make sense to let someone create a hull and then someone else try to fill it with decks containing quarters, labs, engineering and cargo areas. However, exactly the latter would be the case if an existing hull were scaled up or down. Starships of one civilization often resemble each other. This has technical as well as traditional reasons. The "wings" of Klingon ships may be a part of such a tradition just as the saucers of Federation starships, while both civilizations use warp nacelles mounted on struts/wings to propel their vessels. Certainly a scaled up version of a smaller ship may be a first step to a new design. But as the larger hull has be reinforced, the new bigger ship may arrive at a more compact shape. The Klingon lineage is logical in that it progresses (size-wise) from the small and airy Birds-of-Prey to the big and sturdy Negh'Var which is not only absolutely but also relatively fatter. Among the Federation starships there are a few exceptions, however. While the compact Galaxy class is a paradigm of large starships, the almost flimsy Sovereign class seems to defy the scaling rules (especially since its nacelles are relatively much longer than those of the much smaller Nova class, not to mention the Intrepid class). There are many examples of enlarged passenger airplanes in the real world, but usually this was done in only one dimension by inserting hull segments (and a potential additional reinforcement of the whole hull). Nevertheless, if we disregard the different engine placements, all mid-sized jet planes developed since the Boeing 707 around 1960 look so much alike that it seems like scaling up whole designs is possible. Certainly aerospace engineering has become extremely complex, and besides the calculation of wing loading (the ratio of the plane's mass to the wing lift) and drag (which increases with the plane's cross-section) it also requires seemingly trivial considerations on how the plane can be filled with seat rows and how a large plane can be accessed from existing airport terminals. The result is that all planes from the B-737 to the A380 look similar, but with a tendency to enlarge the wings disproportionately in order to keep the increase of wing loading moderate (in other words, a partial compensation of a scaling effect). Maybe the latter is a cue why the the nacelles of the Sovereign class are so long? Summarizing, the "scaling paradox" forbids that huge starships may be composed of flimsy structures or may have big movable parts. Despite the existence of forcefields (IDF) starship shouldn't unnecessarily consume energy just to keep them in one piece. Aside from these more fundamental restrictions, it is not generally impossible to scale up or down the design of a real vessel. After all we are dealing with fictional technology whose properties are only partially explicable with real physics. The question whether a starship in a shown configuration at a definite size works at all would have to be answered first before we can bother about scaled designs. There may be certain reasons like design tradition due to which vessels of different dimensions may look similar, but not quite the same. The logic of engineering dictates that devices of different sizes must look different in some fashion which is not always easily predictable, as the real-world example of jet airliners demonstrates. Studio miniatures or CGIs of Star Trek ships ought to be at least slightly altered when they are meant to represent ships of another size. If this is not the case (especially if enlarged starships look too familiar or if they sport gigantic windows), we may either assume that the camera shows a wrong size or a wrong shape of the ship. The Bird-of-Prey Size Paradox - one, two or even more sizes?